After the whistle blew at the end of the work day, working-men who poured out of the factories that were packed into Hamilton’s 19th-century downtown core often stopped by another common fixture of working communities: the local tavern. The tavern was a place for Hamilton’s working men to relax together. It was often also a cheap place to find lodgings, and served as an employment information centre. The working-class tavern was an important place for talking and organizing. 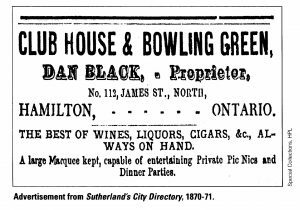 After Dan Black’s Club Ho use opened on James Street in 1866, it quickly became a favourite meeting place for Hamilton craft unions. Free from harassment by employers or city officials, Dan Black’s Club House offered an open forum for discussion. Workers from the car and locomotive shops of the Great Western Railway at the foot of nearby Stuart Street frequented the Club House. Their union, a local of the British-based Amalgamated Society of Engineers, proclaimed Dan Black “the Landlord of our Club House,” and presented him with a pipe and a ring for his wife. In late January 1872, Dan Black’s Club House played host to meetings of moulders, blacksmiths, machinists, and carpenters and joiners.